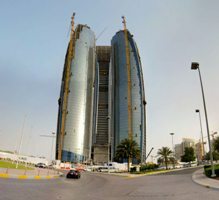 Abu Dhabi is on the verge of launching the Middle East’s longest traffic tunnel which will allow motorists heading into the city from the eastern entrance to emerge from underground at its western edge without having to make any stop. The Department of Transport has started a comprehensive tunnel and road construction project in Abu Dhabi to further improve the road infrastructure and accommodate the traffic growth. The total cost of the project is estimated at Dh700 million and is expected to be completed before the end of the year, the DoT said in a statement on Monday. The project is aimed at improving and upgrading the road and traffic infrastructure on Bainunah Street and part of the Ras Al Akhdar area in the Capital. The project work has been awarded to Al Naboodah Contracting Company LLC. The project consists of two tunnels, one of which will be as long as 540 metres and will consist of two lanes, providing direct access to Etihad Towers. Jumeirah at Etihad Towers — which is expected to open in Abu Dhabi in September 2011 — will be priced in line with other five-star luxury Abu Dhabi hotels, which general manager Doris Greif said generally offered slightly lower rates than in Dubai. “We need to differentiate between the pricing of something like a Dubai beachfront hotel and a city hotel [in Abu Dhabi],” explained Greif. 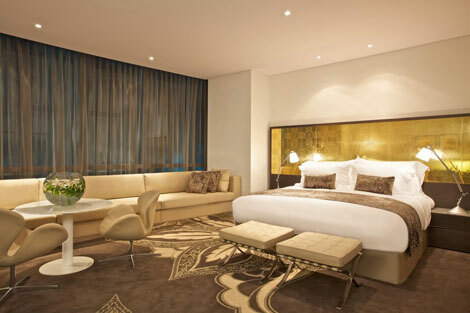 Luxury hotel group Jumeirah is to open its first Abu Dhabi property in 2011. 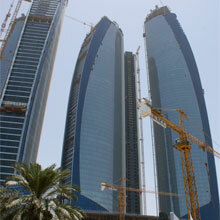 The Jumeirah Etihad Towers will have its soft opening in September with the official launch date set for November 11. It will form part of a five-tower complex also including residential apartments and office space, located on the west side of the Corniche, opposite Emirates Palace hotel . Hotel general manager Doris Greif told Business Traveller it would be “very modern – a massive mixed-use development [the likes of which] Abu Dhabi hasn’t seen before”. The 66-storey hotel tower will have 397 rooms and suites and 199 serviced apartments. Rooms will start from 41 sqm in size and feature sea views, 42-inch flatscreen TVs, free wifi, media hubs for linking your gadgets to the TV, and separate baths and showers. There will 13 food and drink outlets, including a pan-Asian fine-dining restaurant and bar across the 62nd and 63rd floors, and Lebanese, Japanese and French eateries. Thanks to the hotel group’s agreement with Caprice Holdings, which owns London restaurants such as the Ivy and Le Caprice (see online news September 21), it will also have a branch of seafood restaurant Scott’s. A Club lounge on the 45th floor will offer 24-hour food and drink, meeting rooms, TV lounges, video-conferencing facilities and shower suites for early-arriving guests. 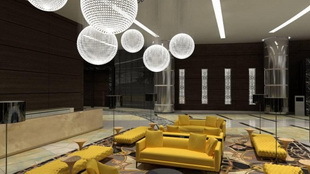 Rather than have specific Club rooms, lounge access will be bookable at a cost with any room in the property. The hotel will also have 14 meeting rooms, including a 1,400-capacity ballroom, a 130-metre private beach, a pool, gym, Talise spa with 14 treatment rooms, a high-end shopping boulevard, and more than 3,000 underground car parking spaces. Jumeirah is due to open its Zabeel Saray property on Dubai’s Palm Jumeirah on December 28, and a Frankfurt hotel in August. It is also set to launch the first of its Venu brand of properties in Shanghai on January 31 (see online news April 29), followed by Baku in the first half of next year. Visit jumeirah.com for more information. 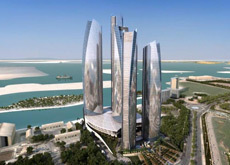 Gallagher Security Management System has won a major contract in the Middle East to provide an integrated security solution for the Etihad Towers in Abu Dhabi. GSMS Business Development Manager, Ian Meadows, confirms they have secured the prestigious project with Channel Partner Bond Communications and Regional Office Cardax Middle East. The project includes the provision of over 1300 smart card readers in 5 towers ranging from 59 to 88 storeys coupled with elevator and CCTV integration. Etihad Towers will include a high-end hotel with a capacity of 600 rooms, as well as 900 residential apartments and 65,000 square metres of office space. Gallagher Security Management Systems is an established market leader of proven core security / access control and perimeter security systems, with a global distribution network. DecoVision, an Abu Dhabi-based interior design firm, has won an AED150m project to furbish the interiors of Etihad Towers. Valued at AED2.5bn and more than 300 metres high, Etihad Towers will comprise five towers including a high-end hotel to be managed by the Jumeirah Group. DecoVision has been commissioned to carry out decoration works for the Jumeirah hotel comprising of 400 guest suites, and 182 serviced apartments, along with a host of public areas including the lobby, spa, gymnasium, beach bar, pool bar, the company said in a statement. The company will also decorate 12 restaurants ranging and an observation deck that will have panoramic views in all directions. 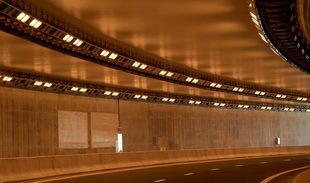 The contract is expected to be completed in early 2011.